Categories: All Parts, Mobility Scooter Parts, Shoprider Sovereign, Shoprider Soverign 4. Shoprider Soverign 4 Newer Model – Tiller Adjuster in good working condition, item is second hand in a ok condition signs of use. 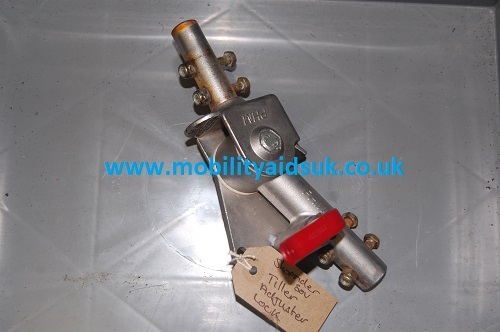 Strider Micro 4 - Speed Control Pot in good working condition, item is second hand in a good clean condition. All our parts are second hand and are fully tested before they are dispatched from our warehouse, all parts are priced to sell and are all security tagged. The pictures are of the exact item Please make sure you order the correct part. Forever Active Discovery - Warning Light in good working condition, item is second hand in a ok condition signs of use. All our parts are second hand and are fully tested before they are dispatched from our warehouse, all parts are priced to sell and are all security tagged. The pictures are of the exact item Please make sure you order the correct part. Mercury Regatta 8 - Tiller Adjuster Ram in good working condition, item is second hand in a good clean condition. All our parts are second hand and are fully tested before they are dispatched from our warehouse, all parts are priced to sell and are all security tagged. The pictures are of the exact item Please make sure you order the correct part. Kymco Mini LS - Rear Wheel and Tyre Each in good working condition, item is second hand in a good clean condition. All our parts are second hand and are fully tested before they are dispatched from our warehouse, all parts are priced to sell and are all security tagged. The pictures are of the exact item Please make sure you order the correct part. Mercury Regatta 8 - Near Side Rear Light in good working condition, item is second hand in a good clean condition. All our parts are second hand and are fully tested before they are dispatched from our warehouse, all parts are priced to sell and are all security tagged. The pictures are of the exact item Please make sure you order the correct part.